Affilorama is a web-based training platform that teaches affiliate marketing. There is a free membership which gives you access to many lessons and videos. This platform is for the new and experienced affiliate marketer. The majority of the training is on point, but there is some outdated information. For example backlinking and PLR content. Affilorama is a great first step in learning affiliate marketing. 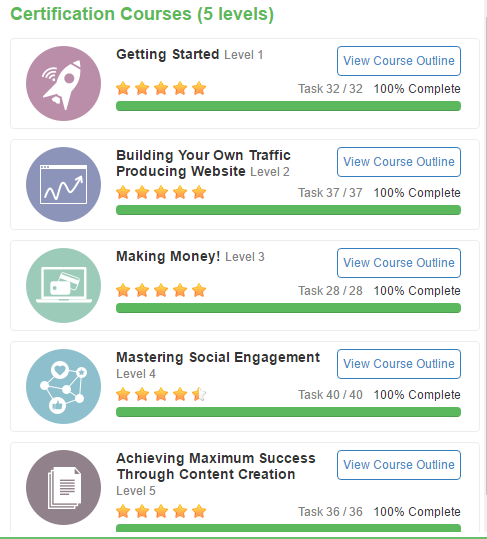 AffiloBlueprint is a course which teaches you how to build a successful website. You will learn: how to search for profitable niches, finding great products to promote and creating your website. It also teaches you how to market your business. Learn how to use search engine optimization, social media, and various other methods to generate traffic to your site. 1-month trial membership of Affilorama Premium – If you forget to cancel this trial membership at the end of that month you will be charged $67 going forward. AffiloBlueprint costs $197 (one-time payment) which does not include support unless you are a premium member. AffiloBlueprint is similar to the premium membership. If you become a premium member this product is not necessary. Save your money. Affilotools is a web-based tool that will help you to track your keywords, traffic, social media, and revenue. Keywords are essential in getting ranked in the search engines. This tool will help you find the best keywords for your site. This tool will help you to find out which keywords are working very well for you. You can connect Affilotools to Google Analytics and get reports of your site’s performance. Check out the upgrade below. AffioTheme is a theme for WordPress websites specifically intending to sell affiliate products. Here are a few reasons you may want to consider this theme. This website theme is created for the affiliate marketer to help increase profits. With Affilotheme you install it and it gives you the basic layouts that convert people into buyers. SEO Optimized to rank and drive traffic for the search engines. If you’re a person who doesn’t have the time, patience, or the energy to work on building your affiliate website, you may want to invest in AffiloJetpack. Everything is done for you. AffiloJetpack is for people who have the money to outsource. It’s like having a business in a box. Even thou 80% of the work has been done. You still have to put in 20% work. 3, 10,000-word ebooks, per niche, to help grow your email list. This last point concerns me. Content creation cheatsheets. I wondering if they are talking about spinning poorly written articles. If that’s the case, spun articles don’t do well in the search engines. You will never get ranked. Free option to check out the platform. Affiliorama offers basic information about affiliate marketing but is very limiting. Many costly upsells which is to be expected when you can join for free at the start. Affilorama suggests using PLR content in the content creation lesson, which is duplicate content. Using this type of content can ruin your business. Search engines, like Google, frown on duplicate content. Overall Affilorama is good for learning affiliate marketing basics in the beginning but for the long term, I wouldn’t recommend it. The training is not exactly in order. You can just pick a topic and read about it. Then jump to another topic and read about that. If you are a beginner I believe you need a more structured, take you -by- the- hand approach, to learning affiliate marketing. Have you heard of Wealthy Affiliate? Wealthy Affiliate is an online platform which teaches you affiliate marketing. Everything is explained to you step by step, not only through the written material but videos also. Each course has a question and answers section. At any given time you can see Kyle, the co-founder, helping in the discussion area. Each lesson takes up where the last lesson ended. In which case you’re not just jumping around aimlessly and not making any progress. Each lesson comes with a list of things you should do before going to the next lesson. Training is updated regularly. Wealthy Affiliate keeps up with the affiliate marketing industry. WA keeps their members in the know. Every Friday there is a webinar hosted by Jay. Jay discusses various topics to help further our education. It is an interactive webinar, you can ask questions and actually get answers. If you miss the webinar, it’s uploaded to the site the next day. Each webinar is over an hour long. Site Rubix Web builder which includes over 2,00 WordPress Themes. Premium membership costs $19 for the first month, after that its $49 a month. There are no upsells with Wealthy Affiliate. Everything you need to build a successful business online is all under one roof. Wealthy Affiliate has an awesome community of like-minded people. People who are building online businesses just like you. Newbies and experienced affiliate marketers are cheering each other on. There is a 24/7 chat room where you can ask questions. Someone is always available to help. Members blog about their successes all the time. Even if they make as little as $5 with their site, they are so excited to share that it works. Affiliate marketing works if you work it. Give Wealthy Affiliate a test run. It’s FREE. If you have been a member of Affilorama or Wealthy Affiliate I would love to get your take on them. Feel free to leave comments below that is relevant to this topic and helpful to my readers.